Bollom Flameguard Ultra Vinyl Matt is a top coat for Bollom Broflame Ultra Basecoat on bare and previously painted wood, Bollom Brosteel Ultra 60 and Bollom Fireshield Ultra Universal for steel. Bollom Flameguard Ultra Vinyl Matt is a top coat for Bollom Broflame Ultra Basecoat on bare and previously painted wood, and Bollom Brosteel Ultra 60 for steel. Bollom Flameguard Ultra Vinyl Matt can also provide Class 0 on bare and previously painted non-combustible surfaces. Ensure that the product to be coated is even and fully dry. Ensure the surface to be painted is sound, clean, dry and free from grease or any substance liable to give adhesion problems. Scrape off any old or flaking paint until you have a firm well adhered surface; if in doubt remove all existing coatings. For existing gloss and eggshell finishes wet abrade and rinse with clean water to remove any residues. Always apply Bollom Flameguard Ultra Primer / Undercoat prior to applying Bollom Flameguard Ultra Vinyl Matt. Flameguard Ultra Vinyl Matt must not be thinned. 12m² per litre / per coat. 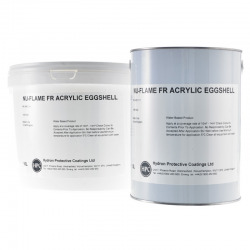 Over Bollom Broflame Ultra Basecoat, Bollom Brosteel Ultra 60 and Bollom Fireshield Ultra Universal one coat is normally sufficient but for dark contrasting colours two maybe required. For use over bare and previously painted non-combustible surfaces two coats are required over Bollom Flameguard Ultra Primer / Undercoat. No, but you can see our recommendations for Painting the Walls around a Fireplace or Multi Fuel Stove HERE. Question: Have an alcove around a wood burner. The paint has powdered off, what paint is suitable for this? Bollom Flameguard Ultra Vinyl Matt is a topcoat to provide a colour and finish, to provide the 30min protection required you will need to apply Bollom Brosteel Ultra 60 first.